Achieve operational flexibility and reliability by using Amazon Web Services (AWS) for your device detection microservice needs. Key Point Allows customers to add-on detection microservice and device intelligence to their architecture through quick deployment on AWS EC2 servers. ScientiaMobile supports WURFL Microservice for AWS APIs for Golang, Java, .NET, Node.js, and PHP to serve multiple applications across the enterprise. WURFL Microservice for AWS provides three editions: Basic, Standard, and Pro. Basic and Standard allow customers to select one of our API languages while Pro allows customers to use all API languages. WURFL Microservice’s client API supplies the HTTP request (and more specifically the user agent) to the the microservice. After detecting the device, it returns WURFL device capabilities. Developers can quickly integrate WURFL into their larger microservice application architecture. The client API leverages its local cache to provide high performance from the overall WURFL Microservice architecture. ScientiaMobile is constantly updating and expanding its Device Description Repository (DDR) to ensure accurate coverage of the newest devices, including long-tail Indian and Chinese devices. WURFL DDR covers 59,000 device profiles, including smartphones, tablets, laptops, smart TVs, and game consoles. As the DDR grows, detection microservice performance stays high through use of caching and efficient database architecture. WURFL Microservice for AWS provides three editions: Basic with 13 capabilities, Standard with 26 capabilities, and Pro with 41 capabilities. These plans include our most popular and widely-used WURFL capabilities. One of these plans will fit our customers’ mobile optimization, advertising, or analytics needs. Basic Edition is geared for mobile optimization use cases. Developers can ensure that content, navigation, and the user experience are tailored to the device and its capabilities. In addition to the manufacturer’s brand name and model name, Basic Edition users get access to our form_factor capability. Form_factor will describe the device as “desktop”, “smartphone”, “tablet”, or several other classifications of devices. Standard Edition is designed for programmatic advertising firms (DSP, SSP, RTB, and Ad Networks). Using WURFL Microservice for AWS, they can target, mobilize, and analyze their ads to improve ROI of campaigns running through Ad Exchanges. In addition to the Basic Edition capabilities, the Standard Edition includes field critical for populating the Interactive Advertising Bureau’s (IAB) OpenRTB API for the Device Object. Standard Edition users receive capabilities describing the OS, Browser, App, screen resolution height and width. WURFL Microservice for AWS can also determine if an ad request is coming from a Robot/Crawler, thereby reducing the potential for ad requests from non-human traffic. Pro Edition is meant for analytics uses. Enterprises can feed WURFL Device Detection into their business intelligence platforms. They can track mobile users, identify trends and problems, and plan investments in future mobile device strategies. The Pro Edition includes everything in the Standard Edition plus more device attributes describing the physical and computing capabilities of the device. WURFL Microservice for AWS achieves over 99% accuracy by searching the internet and analyzing over two billion user agents per month. ScientiaMobile quickly identifies new devices, including long-tail Indian and Chinese devices, and delivers high-quality device intelligence updates to commercial customers every week. For even greater accuracy in identifying specific iPhone and iPad models, customers can add-on ScientiaMobile’s WURFL.js. WURFL Microservice for AWS’ XML Updater will automatically check each week for a new device data XML snapshot, download, and reload the engine. It can do this with no interruptions to serving requests. With this automatic updating, WURFL Microservice for AWS is an always-updated solution, with high accuracy, and minimal maintenance. End User License Agreement (EULA) WURFL Microservice for AWS can be read here. 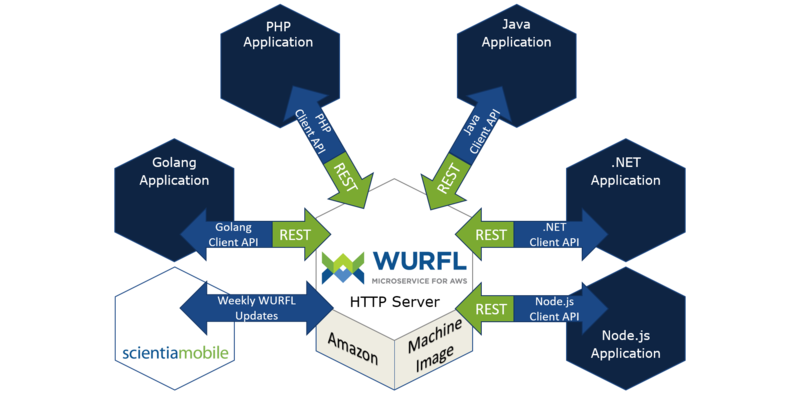 WURFL Microservice provides a quickly-deployable device detection system that allows other components in a microservice architecture to obtain device properties.... customers can use their favorite programming languages and enjoy performances on par with our traditional in-memory APIs.